The candidate pool remains more or less the same even if there is a lull in hiring activities. If you are one of the few companies that is actively pursuing to fill a job position while other companies are taking a break, then the greater the opportunities there are for you to attract top talent. Use this down time to get up as many job postings up as you need to; additionally reach out to recruiters for support. Why wait till January? Get the process started even if it is just the preliminary paperwork – this definitely helps give you a kick start in January. But remember, if you can get your job postings up, you could be speaking to candidates in a non-saturated market and finding candidates that are not in the same pool as your competitors. Hiring your perfect candidate before your competitor starts their search could be the strategy you need to give your company a boost in the New Year. Have you ever wanted to present your selection of candidates to the decision makers but you couldn’t because they are out of town on business matters? Well, now is your chance. A lot of the decision makers are going to be in town during the holiday season and now all you have to is get them in one room or use options like Skype or Google Hangouts to get in touch with those who can’t make it to the office. These are just some useful tips on how you can make the best of the holiday season for your hiring plans. So what are you waiting for? Go on and get those job postings out there. 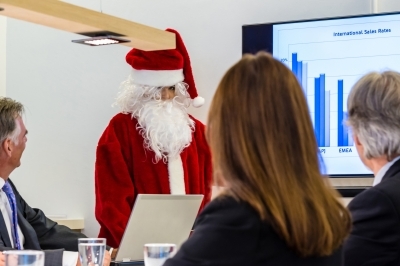 Do you have tips and tricks for hiring during the holiday season? Share your thoughts with us and we can add them in.